You must add Fruit in your daily diet it is best to eat fruit to get glowing skin. You must eat Fruit by eating fruits it keeps your skin rejuvenate, natural hydration and also improve your skin texture. Eating fruit will get you a clear complexion and will also make your skin appear youthful and glowing. Fruits have no side effects and are affordable at the same time. They are free from poison and have a lots of skin and health benefits. Banana are also a rich source of fiber, minerals, magnesium and potassium which helps for a proper blood circulation in our body and build our immunity system. Banana fruit help you reach your weight loss goals and keep your bowels system healthy. Instead of eating unhealthy meals we must eat banana as a snack. Lemons are easily available in market Lemons this fruit is a citrus fruit which is rich in vitamin c, Vitamin B, Phosphorus and Carbohydrates. This Fruit acid is good for skin. Lemons act as a natural bleaching properties which help in making a good cleanser that lightens our blemishes, acne scars, lighten and reduces the spots and skin tone. Lemon juice has a lots of beneficial nutrients, which improve the health of the skin and body. Lemon this fruit we can used internally and externally internally for many health benefits and externally for lots of skincare products. Lemon is best for our skin. 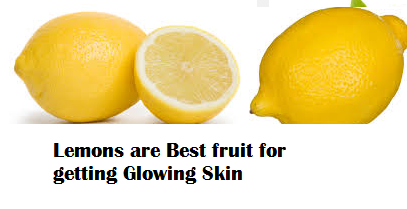 Lemons work best to lighten the pimple marks. We must drink a glass of warm water mixed with a lemon juice and 1 teaspoon of honey. 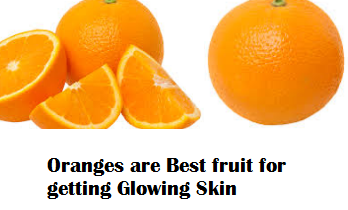 Orange this fruit is rich in citric acid which help us to get rid of acne. Oranges are a rich source of Vitamin C Orange is best and excellent beauty aid in reversing the aging process.Oranges helps us in improving the texture of our skin. Dont throw away the peels we must Dry them orange peels in the sun and make powder of it, and must store dried powder in an airtight container. To get clear and glowing skin we must use this natural scrub once a week. Eating oranges activate the detoxification of our body. It keeps oxygen in the skin and make our skin radiant and look fresh. This Citrus fruit acids exfoliate our skin to reveal a brighter skin every day. 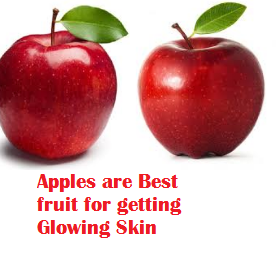 Apples are also a best fruit for getting glowing skin. By eating raw apple we can gain beautiful and glowing skin. Apple is a wonderful and best fruit which has skin friendly nutrients such as copper and vitamin C. To Make your skin look youthful you can have an apple a day. The essential minerals like potassium is required for your skin is also available in apple. The high antioxidant content present in apples prevents cell, tissue damage and aging. Apple this fruit minimize wrinkles, fine lines and also keeping our bowels clean. We all must apply apple juice and add honey on your face, let it dry and once its dry you must wash off. This is good and best hydrating face mask. Papaya are rich source of antioxidant, enzyme called papain is present in papaya. 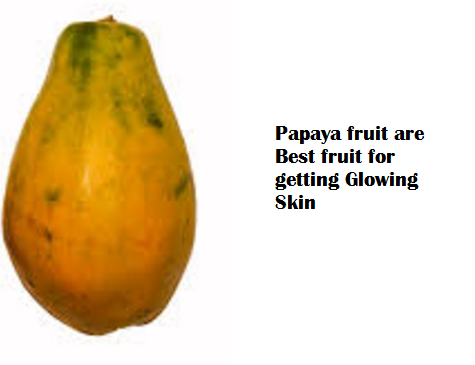 Papaya are best and good if you want to have a healthy youthful glow. Enzyme called papapin can remove skin impurities and also remove the dead skin cells when papaya is applied on the skin topically. We must rub our face with the inside of the papaya for about a minute to exfoliate, cleanse and soften your skin. Blend papaya and Two tablespoons of honey or yogurt and apply this mixture as a mask. We must clean our skin and apply it. We must use homemade fruit face masks on regularly basis to improve our skin texture and tone. We must grate this skin-cooling ingredient. After grating we must apply the juice on the face and neck and let it dry. Once it is dried we must wash it off. We must refrigerate the remaining pulp and must apply the pack for our eyes. Mixed Fruit Face Pack comprises the pulp of all fruits available in the market. 1 spoon of each fruit pulp should be added and blended and we must massage it all over the face and neck. Kiwi fruit puree and one spoon of yogurt. We must mix these two and massage it on our face. We must keep it for 20 minutes and than wash off. We must take strawberry fruit pulp and mix it with water. Massage it on the face and wash it after some time.